Thanks to all of you who helped spread the word about the FREE DAYS for Ghost Hand FEB 14-16 on Amazon Kindle. The results FAR exceeded even my wildest expectations. I was hoping for 5,000 downloads. 10,000 was a pipe dream I’d heard thrown around by those who are considered “made” in the self-publishing industry already. So, when the final tally was 11,554 downloads, I was kind of blown away. I also cracked every international market Amazon has including: India, the UK, Germany, France, Spain, Italy, Japan, Canada and Brazil. Of course, not everyone who downloads a free book will read it. And not everyone who reads it will like it. But the fact that my book is now in that many reader’s hands is pretty awesome. Sales have steadily increased since the free days ended and Ghost Hand is now ranked #34 in Amazon’s Paid Fantasy Series list. The Ghost Hand ebook has now returned to the still-economical price of $2.99, and I believe it is worth every penny. And the paperback will be on sale for $10.99 until the end of February. Please keep spreading the word to friends and family if you’ve read the book and liked it. And don’t forget, you can give e-books as gifts to anyone with an e-reader. It’s as easy as sending an e-mail. Now, after all this energy spent giving book one a good send-off into the world, I will return to the joyful grind of writing book two, Ghost Hold. Traditionally published authors have marketing teams and big publisher money behind their book campaigns. Self-published authors like me have the internet, social media, and word of mouth. So, I thought I would make a list of 15 simple ways readers can help promote their favorite authors, each in five minutes or less. I’ve inserted my new YA paranormal thriller, Ghost Hand, in the list below, but the same list can be applied to other authors and books you wish to support as well. 1. Tweet about Ghost Hand, or follow my twitter @rippatton and retweet my tweets. 2. Like my NEW Facebook Author Page. 3. Like Ghost Hand on its Amazon page. 4. Recommend Ghost Hand to friends on Goodreads. 5. Become my friend and fan on Goodreads. 6. Rate Ghost Hand on Goodreads. 7. 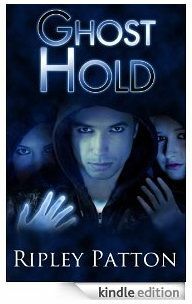 Add Ghost Hand to a shelf or Listopia list on Goodreads. 8. Vote for Ghost Hand as best book of November 2012 on Goodreads. 10. Tell a friend about Ghost Hand and lend or gift them a copy. 11. Request Ghost Hand at your local library with their “Suggest a Purchase” form. 12. Talk to the clerks in any bookstores you visit and ask if they carry the book. If not give them a short book report and recommend they order a few copies. 14. Share my website www.ripleypatton.com with someone. 15. Suggest Ghost Hand to your favorite local or online book group. So, was taking my daily Portland walk with hubby today and came across a Little Free Library. Of course, as soon as I got home I looked up the website and found that Little Free Libraries are cropping up ALL OVER the country and ALL OVER the world. You can order premade or do-it-yourself kits for your own little free library from the website. They aren’t cheap mind you, but they are adorable and waterproof and a cool way to have your own freakin’ library (I have ALWAYS wanted my own freakin’ library). And they even have a special limited design that looks like an old red English phone booth. What I noticed on the website is that people really get into decorating and personalizing their little libraries. If they love gardening, they paint it all gardeny and stock it with their favorite gardening books. There are libraries for kids. Libraries of all Dr. Seuss. Libraries of mysteries. And memoirs. And fantasy. You can buy and install a little library as an individual or as a group or org project. You can buy and install ONE, or a truckload. Another great feature on the website is a Google map that shows you all the locations of the Little Libraries. I looked up the one I had found and it included the address location, the Stewards (those who made and maintain it) and even the Steward’s e-mail address. How cool is that? Anyway, this got me to thinking about how we writers could use Little Free Libraries to promote reading and our own works. If you belong to a writers group, you could sponsor a Little Free Library in your area and stock it with books by your members. If you are a fantasy writer, how fun would it be to have a Little Free Library outside your house, all decorated with dragons and such, featuring your books and books by your favorite authors. If you write YA, have a YA Little Free Library. I definitely want to buy and install one for my apartment complex. And who knows? I may even hit up some of you writerly types for your books to stock it. Be sure to look up and check out the local Little Library in your area. Oh, and spread the word. And go build a Little Library of your own.